Here is a beautiful ornamental Victorian clip art brooch. 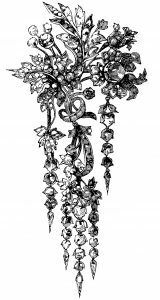 The description in the book indicates this brooch was “a mass of diamonds, strung together in the most graceful form, in imitation of a bouquet of flowers.” My original scan is from The Art Journal Illustrated Catalogue, published for the proprietors, by George Virtue in London, 1851. Beautiful! This will make a lovely brush for Photoshop. Thank you! You’re welcome Peggy! I agree with you and this is one I think I will include in my first junk journal that I am slowly working on, which has a Victorian feminine theme.